The Clustered Network File System (CNFS) is a capability based on IBM® General Parallel File System (GPFS™) running on Linux® which, when combined with System x® servers or BladeCenter® Servers, IBM TotalStorage® Disk Systems, and Storage Area Networks (SAN) components, provides a scalable file services environment. This capability enables customers to run a General Parallel File System (GPFS) data-serving cluster in which some or all of the nodes actively export the file system using NFS. 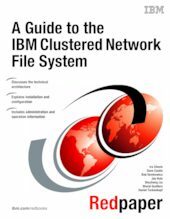 This IBM Redpaper™ publication shows how Cluster NFS file services are delivered and supported today through the configurable order process of the IBM Intelligent Cluster. The audience for this paper includes executive and consultant decision makers and technical administrators who want to know how to implement this solution.